California Casualty is thanking first responders with the chance to win a $7,500 Garage Makeover. Law enforcement officers, firefighters, and EMTs can enter to win at http://www.contest4heroes.com. We are grateful for the tough job first responders do every day for all of us. California Casualty wants to thank first responders with a new Work Hard/Play Hard Sweepstakes. 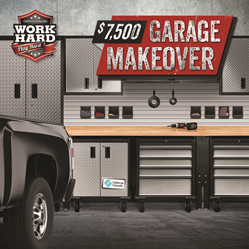 One lucky law enforcement officer, firefighter or EMT will receive a $7,500 Garage Makeover. Public safety professionals can enter at http://www.contest4heroes.com. The Work Hard/Play Hard “$7,500 Garage Makeover” drawing is open to peace officers, EMTs, and firefighters – American heroes who work hard and risk their lives. Entries are being taken now through October 31, 2019, at http://www.contest4heroes.com. The winner will be announced in November. First responders can learn more about California Casualty and how it appreciates all they do at https://mycalcas.com. Headquartered in San Mateo, California with Service Centers in Arizona, Colorado and Kansas, California Casualty provides auto and home insurance to firefighters, law enforcement officers, educators and nurses across the country. Founded in 1914, California Casualty has been led by four generations of the Brown family. To learn more about California Casualty, or to request an auto insurance quote, please visit http://www.calcas.com or call 1.800.800.9410.